Expatriation is a dream project for many persons, but not everyone takes the big step. 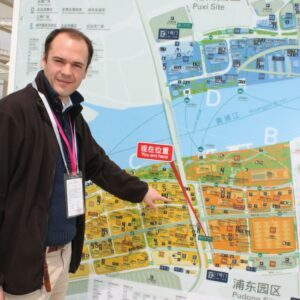 John Rollier left a comfortable corporate job to taste the entrepreneurial adventure in China, and headed to Shanghai in 2007 with a few suitcases and his wife. During the five years spent in China, the experience has been very hands-on and a fast learning track. 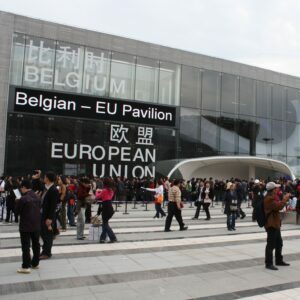 John had for example an amazing experience building the Belgian-EU pavilion during the Shanghai Expo 2010 and then started his own company trading construction materials between China and the EU. Five years later, in 2012, John came back to Belgium with his wife, three kids and a start-up to develop. After a few trial and errors and a lot of thinking about a sustainable business model the trading activity transformed into FyBox. Nowadays FyBox is a leader in lightboxes for point of sales in Belgium, and is expanding to other neighboring countries such as France, Italy and the UK. FyBox stands for perfectly designed lightboxes, razorsharp HD printed textiles and a fully automated platform to manage the renewal online in a few clicks. At this moment FyBox has around 1000 lightboxes installed in different point of sales, such as International Duty Free, Denham The Jeanmaker, Galleria Inno, etc. The Belgian Chocolate House is also equipped with FyBox lightboxes and won the 2017 Mercury price for ‘best retail concept of the year’. Getting out of the comfort zone to jump into the expatriation and entrepreneurial adventure has definitely been a rewarding choice according to John: “it’s all about being actor of your own life”. The full article of the Trends-Tendances dated 20th of April 2017 page 83 can be read online (subscription needed) or the scanned version can be read here.